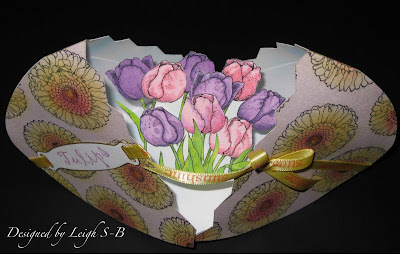 Velvet Paw Creations: Spring 3D Pop-Up Easter Egg Card & Blockheads Flower Stamps! 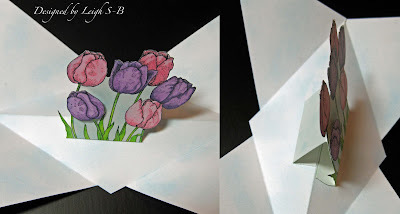 Spring 3D Pop-Up Easter Egg Card & Blockheads Flower Stamps! I think you guys are in for a real treat with my latest project! Here's my new Blockheads Design Team creation! 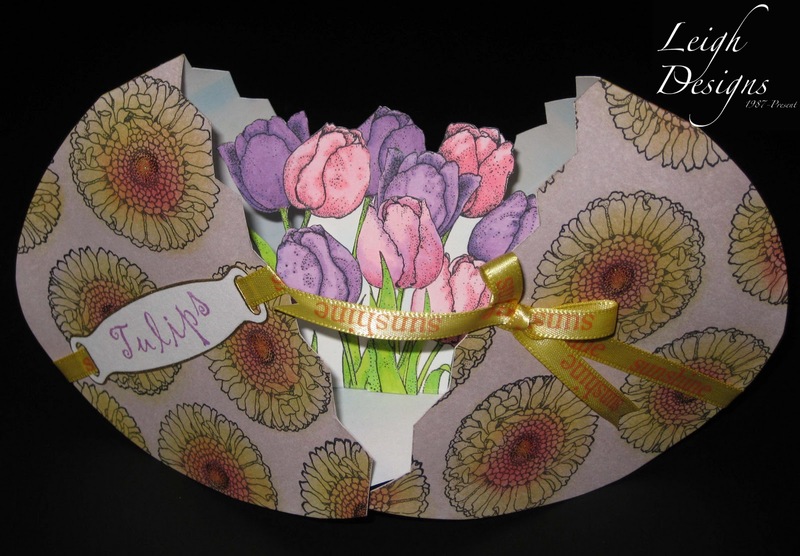 Spring 3D Pop-Up Easter Egg Card! This one is so much fun but it is challenging with some tricky bits so you'll need all your wits about you before attempting it! But don't worry its not too hard and my tutorial will walk you through it! I received one of these cards as a RAK (random act of kindness) about 6 years ago and I've been wanting to design something with this template for some time now and I've finally done it, yay! Unfortunately the card was not signed (always remember to sign your creations) and I don't know where this idea originated but I was able to dismantle and reverse engineer it. While designing my project I made some changes to the original and now I think I've got an improved version for you to experiment with! 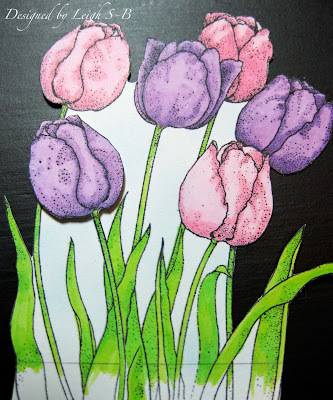 It's finally spring and I've been having loads of fun with the Flower rubber stamps from Blockheads Paper Arts and I knew they would be perfect for this project! I've made a template for you to print out or just use as a guide line based on the included measurements. So lets get started! 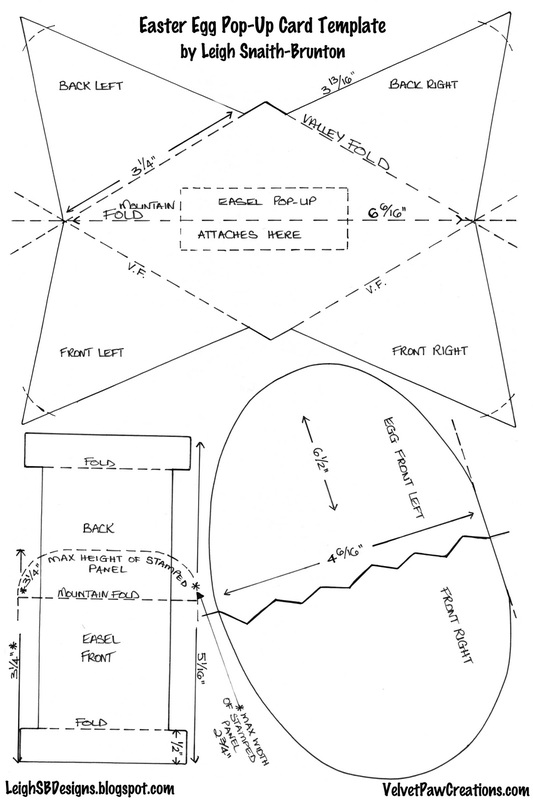 Draw the egg shape onto a sheet of white heavy weight cardstock. It is more of an oval really coz it needs to be close to symmetrical as possible so it can stand. Then draw a mirror image of the shape with a fold line in between. Apply colour to the entire egg using the 'Direct-to-Paper' method, staining the cardstock with Milled Lavender Distress ink. 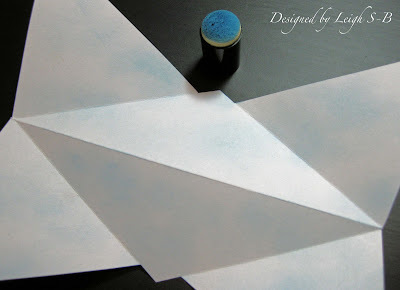 Blend as you go with a piece of paper towel and then score and crease along the fold line with a ruler and a bone folder. 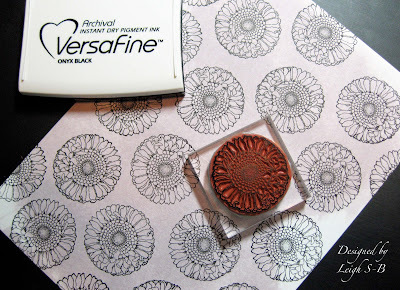 Stamp the single Calendula flower image all over the egg shape in Versafine black ink and heat set to prevent smudging. 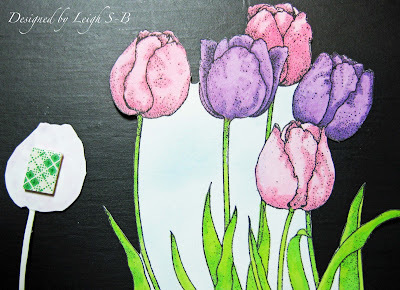 Cut out the egg and colour the flowers with chalks. 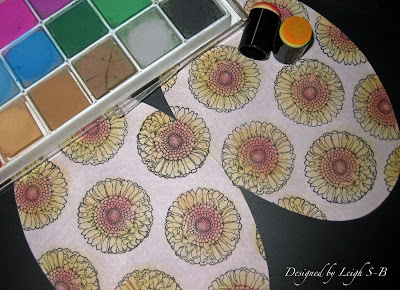 I used finger sponge daubers to apply the chalk to the images, starting with yellow, then orange and red for the centers. 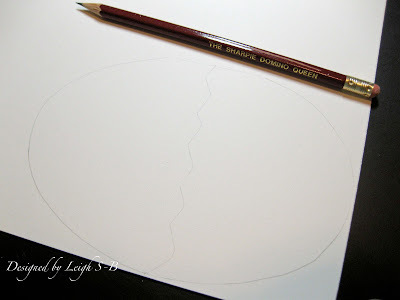 Fold the egg at the crease line and draw a crack line down the middle. Cut the egg in half along the crack line. Now you've got 2 broken halves of an Easter Egg. 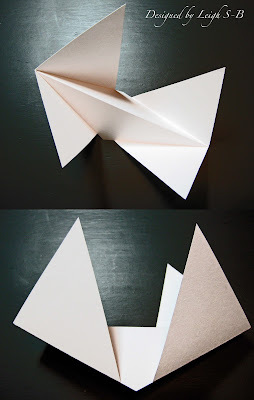 Then trace out the interior folding mechanism for the 'pop-up' part of the card. Score and fold along the dash lines. The main center fold is a mountain fold and the 4 triangle flaps are valley folds. 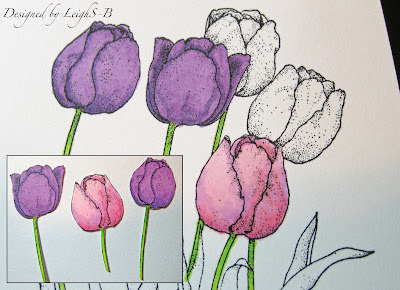 Stamp the large Tulips image twice and the single Tulip once in black Memento ink onto heavy weight white cardstock that is suitable for Copic markers and colour in the flowers. Memento is a recommended ink pad for Copic markers. 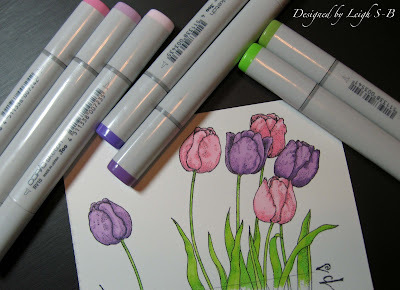 I used RV10, RV12 and RV13 for the pink tulips, V15 and V17 for the purple tulips and YG03 and YG06 Copic Sketch markers for the leaves. You can totally use your own favourite colouring products too of course. I often use coloured pencils, watercolour pencils, chalks and Marvy brush markers too and they work just as beautifully! You can find all of those alternate products at Blockheads! 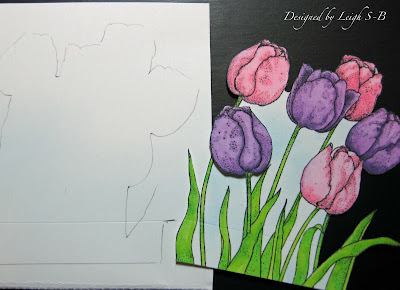 Then colour a background for the flowers that looks like a blue sky with fluffy white clouds in light blue Decorating chalks and a sponge dauber. Repeat the same process for the back of the egg pieces and the interior mechanism too. Pretty much all the areas that will be seen once the card 'pops' open! 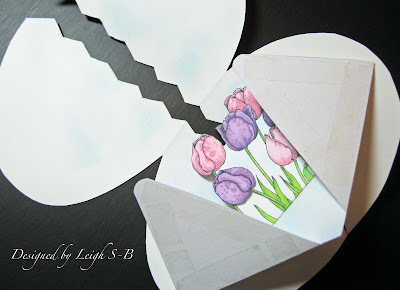 Cut out the flowers to create the 'pop-up' panel part of the card and the single Tulip image and layer it onto the front with foam tape or a pop dot for extra dimension. 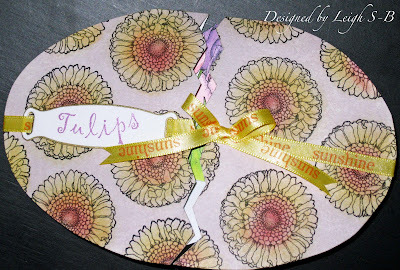 Also cut out the extra Tulips and put aside until needed. Adhere the 'pop-up' panel to the center of the 'pop-up' mechanism section on either side of the mountain fold line. Trim or use a corner punch to round of the points on the flaps. 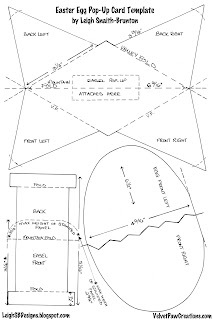 Apply double sided sticky tape to all four of the triangle flaps and adhere the back side of the 'pop-up' mechanism section to the 'back' portion of the egg halves. Fold down the front of the egg and press down firmly to adhere the front flaps to the 'front' egg halves. 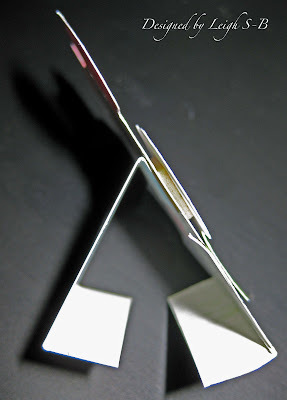 TIP: If you want to include a written message with the card then do it now before assembling! You can write it on the blank area on the base of the interior 'pop-up' section. 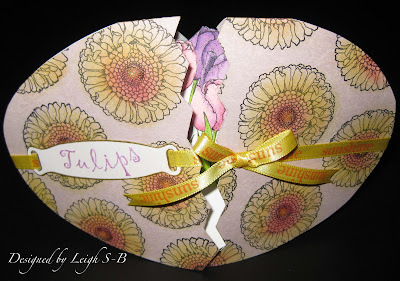 Test the pop-up card and determine where to start filling in the extra flowers and leaves on the 'pop-up' panel. 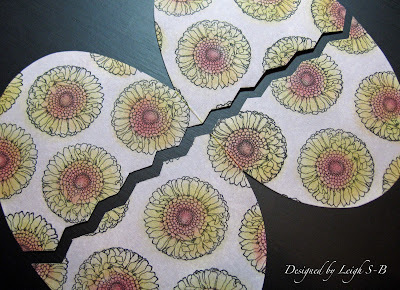 Adhere the extra flowers and leaves with double-sided sticky tape. The photo below on the right hand side shows the difference it makes with the extra flowers added to the bouquet! 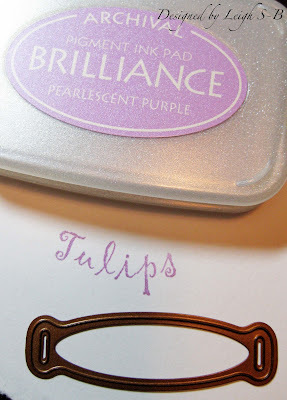 Stamp the word 'Tulips' onto white cardstock in purple Brilliance Pearlescent pigment ink. 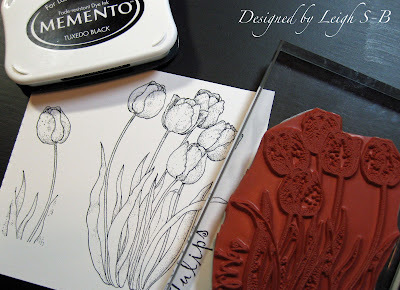 The word comes with the Tulips stamp image. TIP: I masked the portion of the flower near the word with a piece of regular sticky tape, inked the word and then removed the tape. I was then able to stamp the word without any of the flower image getting in the way! 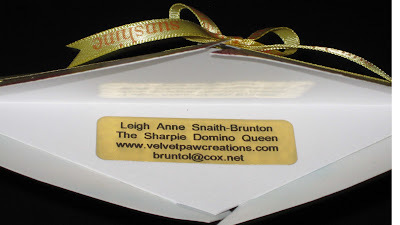 Cut out a ribbon label with a Spellbinders die and edge it with a metallic gold paint pen. 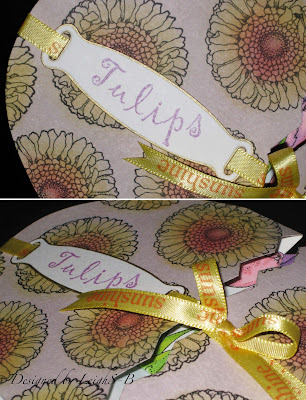 Thread the label onto a length of 'Sunshine' yellow satin ribbon. I think I got this ribbon in the $1 section at Target (I LOVE the $1 section LOL!). But you can find similar ribbon at your local craft stores. Adhere the ribbon and the label to the front of the egg card and hide the ribbon ends inside the egg with double sided sticky tape. Make a bow from the same ribbon and adhere it to the Easter Egg card with a glue dot. Trim the ends of the bow into dove tail points. Finish off the card by adding yellow glitter glue to the centers of all the flowers on the egg for just a touch of sparkle! The card does lie flat so will fit nicely into an envelope. Thanks for stopping by! I hope I've inspired you to make your own 3D pop-up cards this Easter! 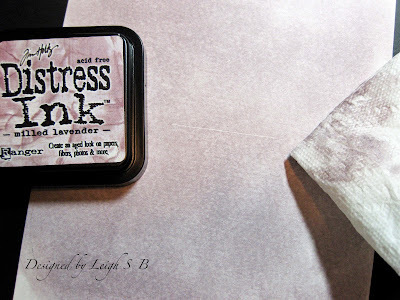 If you'd like to see more creations featuring Blockheads Paper Arts stamps and products then check out my fellow Design Teamster's blog, Karen of Dreaming and Creating! Fantastic project, I will certainly try this one out. Thanks for sharing. Amazing project!!! 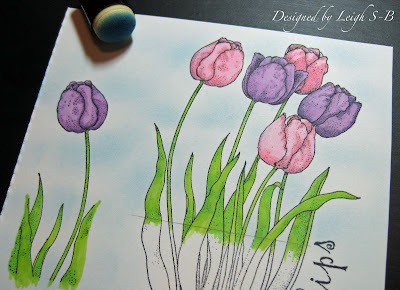 Love how you colored the tulips. It is like an origami egg! So cool.